Epic (/ˈepik/): When a proposed plan goes to sh!t and you find yourself off route; taking place usually in the dark. 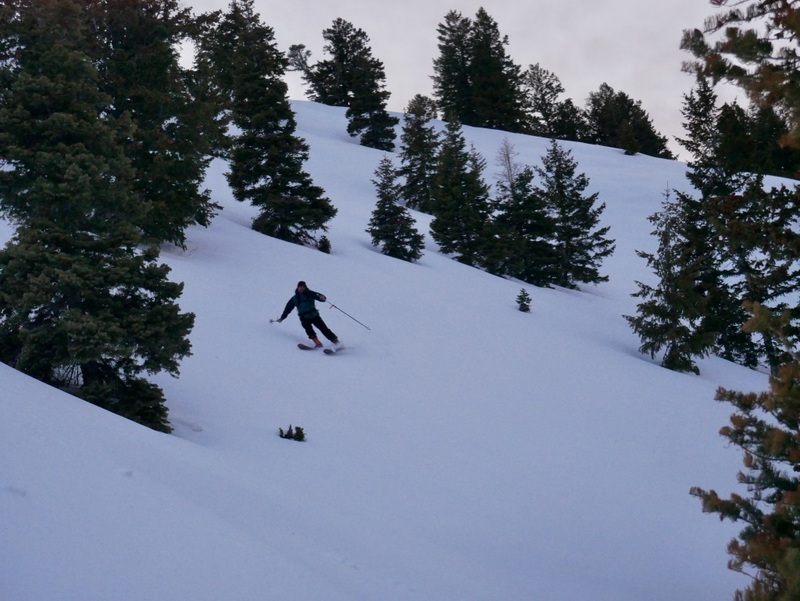 This past Tuesday night, my buddy Pete and I decided to check out a new zone to ski tour. 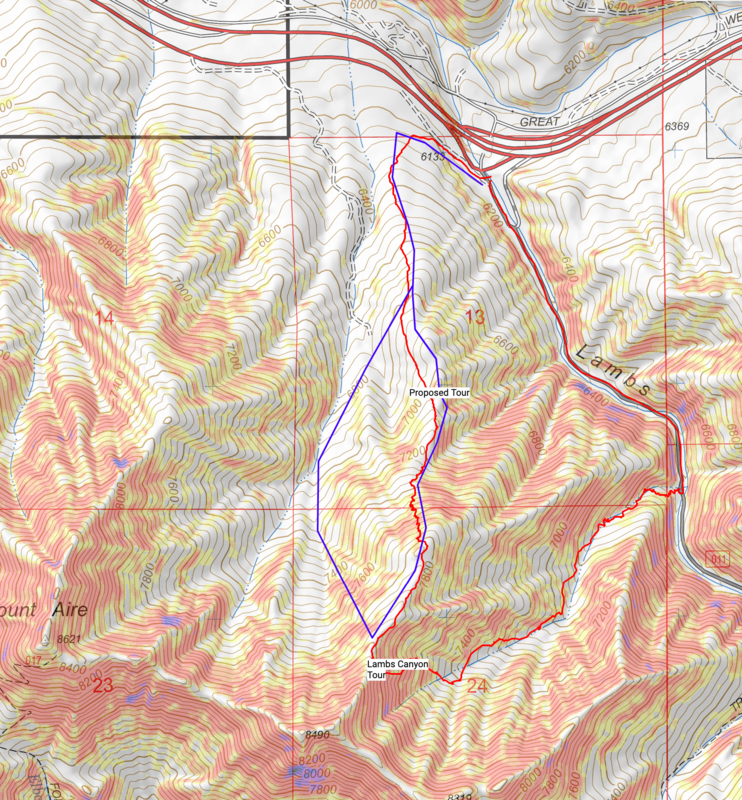 The plan was to ski Mount Aire in Lambs Canyon. The peak is visible every time you drive East on 80 going from Park City to Salt Lake, and for that reason, I wanted to ski it! So we met up in the parking lot, just off the exit and went over our “plan.” I had no beta about his zone, and only knew it was skiable because one, there is snow, and two, I saw skiers skinning up once before. So our plan was to head up the ridgeline and see what is skiable from there. At first, it was great. The approach through the winter vegetation was pretty mellow and easy. Following up a previously set skin track, we kept adapting our plan to what we could see. The initial plan, based on the topo, was to ski up to the the shoulder of Mount Aire to ski a Northerly aspect, or up to the summit to ski a Northeasterly aspect. Are we climbed up the eastern ridgeline, we could see that the drainage to our right, that separated us from the western ridgeline that led to the summit, was overgrown with vegetation. This meant skiing our that drainage would have been a no-go. Our plan changed to skiing through a grove of evergreens with a straight shot down to the drainage and a quick tour back up to the ridge before the final descent back down the skin track. All of which were reasonable plans and smart. But that was soon about to change. The further we moved up the ridge, the more possible runs appeared. That’s when we saw some chutes that dropped off the opposite side of the ridge we planned to ski, but would take is directly into lambs canyon making a quick exit. Seeing ski tracks there help reaffirm our decision. And finally, when we crested the high point from which we planned to ski from, a beautiful northerly aspect bowl appeared. Untouched, and theoretically would drain back to Lambs Canyon as well. It looked so good, we just had to ski it. And this was the moment we started making one mistake after another. The time was about 7PM, right in the golden hour of sunset. The remaining daylight at this point was about an hour, but quickly fading. We transition on the side of the slope without any prior knowledge of this zone and zero clue about how the exit was going to be or how far we had to go to get back to the Lambs Canyon road. It looked overgrown in the drainage, but nothing we couldn’t handle. Or so we thought. I pointed my skis downhill and immediately it turned out to be terrible. There was zero consistency in the snow’s firmness from one turn to the next. A thin layer of sun crust that froze over top 8″ of heavy sun effected, corn snow. One moment you’re on top of the snow, the next it’s tugging on your boots because you’re completely submerged under the snow. Jump turns were required to navigate the pathetically mellow, 34deg slope. It was bad skiing. Flat out, terrible. Pete immediately joke that he didn’t want any photos of him skiing the run because of how poorly the skiing looked. Even with the bad snow, we were still all smiles. It was still skiing, so we were having fun! Pete even sent a small cliff… onto another cliff that resulted in him getting stuck waste deep into the confusing snowpack. After this, things only got worse. The drainage turned out to be much more difficult to navigate than we thought. Terribly overgrown, with narrow snow strips for us to ski through trees. Being that the slope was south facing, the snow was overly sun effected quite shallow in some areas. We pushed our way through the flats, covered our faces as we blasted through the low tree limbs, and side stepped our way up and down the traverse. It did not look good. To make matters worse, we’d only gone about a half-mile and it was now dark. I whipped out my headlamp, but Pete did not have one. That was the moment the ski tour officially became an epic. We got to a point where the snow disappeared or became intermittent on our path forward. Our only option was to bootpack it from here on out. Thinking because the snow was melting on this face that it would be shallow was a dead-wrong thought. We strapped our skis onto our packs and started navigating down the drainage towards the gully to reach the other side where we hoped the snow would be more easily navigable. Our first steps downhill had us sinking all the way to our waste. It became less of a bootpack, and more of a falling down the hill with style. The snow gave way beneath my boots and I fell head first into the back of Pete. It was straight out of a 3-stooges episode, but in this case it was just 2-stooges, stuck in a canyon, waste deep, in the pitch black. We climbed out the steep face on the other side of the gully where tall evergreens allowed us to pass beneath. We trudged our way out, crawling on our knees in hopes of not post-holing at some points. It started to become desperate, even tho the topo said we only had another 200 feet of vertical descending to do, we still had no idea how far we had to go to reach the road. I knew it was close, but we were at a crawl of a pace. The time was 8:46PM and Pete and I still thought we had another hour on the adventure. Our only clue of location, besides a general idea on a map, was that we could see the canyon wall on the opposite side. So we knew we were headed in the right direction, but there was no clear way of getting there. We descended into the gully to take the most direct way out, and that’s when the snowpack became even more sensitive. Every step was a guessing game. One moment you’re onto, the next you’re sinking past your waste. It was awful. We’d head into one direction, only to be turned around because due to impassible vegetation. One way after the next. Finally, we popped our heads out of the trees and saw ski. Clear ski and the vast canyon across the road. We made it! The quick ski tour, a short up and back, that turned into a proper epic adventure. Skiing down the road, back to the trucks, was by far the most frustrated I’ve ever been on skis, yet the most stoked. We had finally made our way out of the drainage. All in total, it was 1.25miles of bushwhacking and post-holing through dense bush and deep snow, but we made it. -Always make a plan at the trailhead, for BOTH the uphill and the downhill-Build in a cushion for time to account for the unexpected that might have you off route in the dark.